The Kizilesu Kirgiz Autonomous Prefecture is located in the southwest of Northwest China's Xinjiang Uygur Autonomous Region. Under its administration are three counties and one city, with a population of 426,200, including 357,000 for ethnic minorities such as Kirgiz, Uygur, Tajik, Hui, Manchu, Mongolian, and Tatar, and so on. Artux City, as the location of the administrative agency, is 1,433 kilometers away from Urumqi based on highway distance. The prefecture borders the Central Asian countries of Kyrgyzstan and Tajikistan, with a borderline of more than 1,170 kilometers. It covers an area of about 70,900 square kilometers, about 500 kilometers from east to west, and 140 kilometers from north to south. The prefecture, which has a temperate continental climate, is located at the Pamirs (a high mountain chain mainly in Tajikistan), about 1,200-7,700 meters above sea level, with many high mountains, such as the "Father of Glacier" -- Mustagh Ata. It abounds in springs, some of which form into mountain lakes. There are seven rivers in the region. The surface runoff is 79.62 hundred million cubic meters, but the usage rate is quite low due to diversion difficulty, as most of the rivers are located in the mountainous area. The area of the mountainous area and river-valley natural forest comes up to about 37,800 hectares. The well-known fruits in the Kizilesu prefecture include fig, pomegranate, Munag grape, and Baren dried apricot. The main species of tree are spruce and white birch, while rose willows and sea buckthorns mainly make up the river-valley secondary forest. The area of pastureland is over 3,300,000 hectares. In its territory, the first-class animals under the state's protection are black and white cranes; there are also 14 second-class animals under its protection. The place is teeming with medicinal plant resources, including licorice, Radix Arnebiae seu lithospermi, asafoetide, Ephedra sinica, Cynomorium songaricum, and Rhizoma Phragmitis. There are a total 30 metal ores of mineral resources, including gold, silver, copper, iron, manganese, chromium, lead, zinc, coal, petroleum, marble, mica, asbestos, and graphite. The deposits of lead and zinc ranks first in Xinjiang. The prefecture boasts two large ports -- the Tuergate Port and the Yerkstan Port, the latter of which is a national first-class port that opened on July 20, 1997. 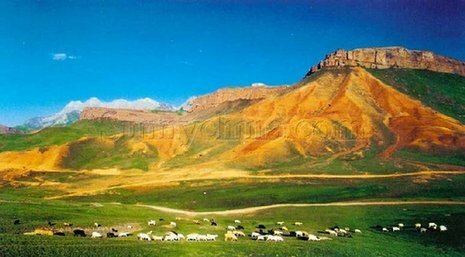 Places of interest are the ruins of the ancient city of Shule, the "Father of Glacier"-- Mustagh Ata, and Yuqitar Grassland.